Have you ever done that? Given yourself something for Christmas? I haven't. But I'm going to this year. It's going to be no-sew. Cheap. Simple. But perhaps not very easy. Also, it's something I know for sure nobody is going to wrap up and put under the Christmas tree for me to open Christmas morning. And the reason I know it for sure is because they can't. Even if they wanted to they couldn't. Not because it's too expensive or because they wouldn't know that I wanted it. But because it would be impossible for anyone to give me this. It's a gift only I can give myself. At the beginning of 2010 I weighed 170 pounds. (170 pounds! Eek!) I had just given birth to Olivia in September so everybody--including me--blamed the extra weight on that. But it wasn't true. Of course everybody has some water weight and whatnot left over after giving birth, but that's not where the bulk of my extra padding was coming from. It was coming from eating too much of things that weren't good for me. It was coming from a major lack of exercise, sleep, and water. My body wasn't healthy. So I set a goal after last Christmas to change my ways and treat my body the way I knew I should be treating it. I wanted to be skinny (Duh. Don't we all want that?) but even more than that I wanted to be healthy. I wanted my body to function as well as it's meant to. I wanted to treat my body as the gift from Heavenly Father that it is and not just some bulky shell. So I got to work. And I set up The Skinny. And on my weigh-in this past Tuesday I weighed 133 pounds. Woot wooooot! But my goal weight is 120 pounds. That's 13 pounds to go. I had initially planned/hoped to meet my goal by mid October, but with the three trips we planned for and stressed about and went on eating healthy and exercising got put on the back burner for a little bit. But now that we're home from all those trips and I'm back on track, I'm ready to meet my goal. So this past Tuesday at my weigh-in I decided I'm going to do what it takes to meet my goal by Christmas day. That means I'll be losing 13 pounds in 9 weeks! Aghh! It's crazy and exciting and a little overwhelming and emotional to think about. I've been working at this for so long. I haven't been that fit in years. But I'm so close. I know I can do it. It just means buckling down and sticking with it. And I can do that. After all, I've spent hours and hours pouring over Christmas gifts for everybody else to open on Christmas. I think I deserve a little something too. Not something expensive or ridiculous. Just something I've been working toward and wishing for for a long, long time. It's time to meet my goal. And what better time to be health-conscious than during the holidays? I'm excited. Not so much excited for passing up yummy cookies and sweets and extra helpings, but excited for the me I want to be. That is the gift that only I can give myself. And that is the gift that I'm giving myself for Christmas. I think as women, as homemakers, as wives and mothers, as caregivers and friends we look so often for the ways that we can give to others. And that is precisely how we are meant to be, how we ought to be. But an empty bucket has nothing to give. Think about yourself. What do you want that nobody else can give you? Is it a healthy body? Some quiet alone time to regroup? The freedom to try something new? A clean house? To read a book you've been meaning to read? To study the scriptures? To enjoy home-cooked meals? To spend time outdoors? To finish a project you've been putting off for years? Decide what you're going to give yourself. And get it done by Christmas. Or at least do your best. :) Then, if it's something tangible, wrap it up, put your name on the tag, and open it up on Christmas day. If it's not tangible, write yourself a letter congratulating you on doing whatever it is you're going to do. Are you with me? I hope I won't be the only one giving myself a Christmas present this year. I hope you'll join me. Starting next Thursday and on every Thursday from now until Christmas I'm going to put up a linky party where you can share what you're giving yourself for Christmas. Or what you're working on giving yourself for Christmas. So get that thinking cap on and decide what it's going to be! Because sometimes all it takes is a little encouragement. Or somebody saying, "Yes, you can!" Or the comrade of others. So while you're working on all the gifts for all the wonderful people in your life, remember that you're wonderful too. You deserve to open the best gift under the Christmas tree this year. 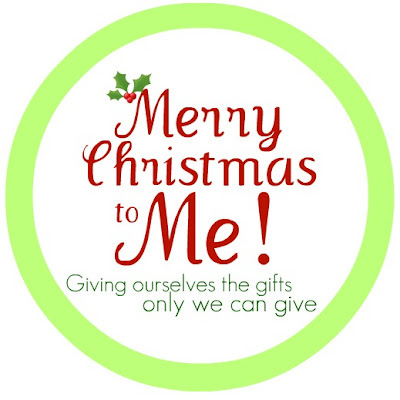 The gift that only you can give yourself. And good luck on your goal! That is great!! I too have been working on my weight! After 5 kids and some anti-depression meds that helped me gain weight:) I have some more to go - but I am working on it and doing good! Keep up the work and I know you can do it!! I like this idea too. I would love to lose 13 pounds by Christmas! I don't always comment, but I thoroughly enjoy your blog and your effort to make your world (and therefore my world and whoever else reads your blog) better. Rock on. A very thought-provoking question. I will be pondering this. And I KNOW you can do it! what an awesome thing to do Katie! and congrats on losing all that weight-that couldn't have been easy. I think my gift to myself will be more "me" time. to read, or just think, without my need to be constantly busy taking over. Wish me luck-that part of me is a pretty stern taskmaster! I've already started on a gift to myself, although the due date isn't until after christmas. It'll still be a chrsitmas gift. Good good idea! !